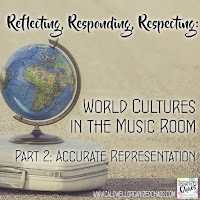 Reflecting, Responding, Respecting: aren't we all the same? Over the last few months I've been sharing my thoughts on ways we can better reflect, respond to, and respect traditionally marginalized people and perspectives in the music room. I've learned so much already through my research, experiences, and conversations and I want to continue to reflect on this topic in my professional and personal life as I continue to listen and learn. One general question that I have heard raised among music teachers that I'd like to look at today is the question of whether we should be taking specific steps to address specific people groups and perspectives, or simply treating everyone and everything with the same respect? Is this conversation even worth having? Simply saying, "I treat everyone with the same respect" isn't enough, because that attitude completely ignores the systemic oppression that is deeply embedded in everything we do. I think as a general concept most teachers would agree that we cannot treat all students the same. We know that different people learn in different ways and so we can't teach all learners the same way. 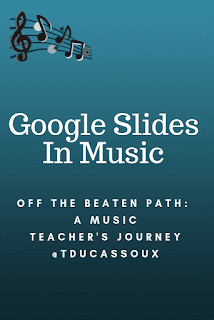 We know that we can't just teach one style of music exclusively and ignore all the others, or teach students that one type of music is inherently better. The trouble comes when we start talking about people groups and perspectives that are structurally, in society at large, underprivileged- particularly if we ourselves are members of a more privileged people group. It's so much easier to keep teaching the way we were taught, or to use the first lesson idea that comes up in a quick internet search, than it is to examine the ways that our society and teaching practices privilege certain people groups and perspectives over others, and learn new ways to counteract those oppressive systems. And yes, those oppressive systems do still exist and have profound effects on our students today. If you aren't aware of the ways our current education system, traditional music education frameworks, and society oppress and ignore people of color, women and girls, non-Western cultures, indigenous people, non-Christians, genres outside of Western art music, etc, then you aren't paying attention. The old adage, "fair is not equal", is abundantly true here- we have to be intentional about handing the microphone to people and perspectives who are silenced in our textbooks and mistreated in our society. As teachers we hold tremendous power. It is imperative that we use that power to do everything we can to balance the scales. This means we are obligated to learn about and focus on our differences. No, we're not all the same, and we shouldn't teach like we are. Black students won't have the same opportunities for success as white students in the United States without changing the way we teach. Girls won't envision their musical futures the same way boys will. American children won't grow up to understand people from other countries as equally-valid human beings. There's another old adage that is abundantly unhelpful: "treat others as you would want them to treat you". This "golden rule" assumes that we all want and need the same things. We don't. We need to treat others as THEY want to be treated, and to do that, we have to listen to and learn what they need. These are not easy conversations, and there are no easy answers. But as I tell my students, worthwhile endeavors are rarely easy! If you haven't already, I hope you will take the time to read through the rest of the posts in this series (click here to find links to all of them) for more concrete and specific thoughts and suggestions, and then join in the conversation! I am definitely still only beginning to learn myself, and I truly want to hear from you so we can all learn from each other- I hope you'll share your thoughts in the comments below. Want to get more timely content sent straight to your inbox? Wish you could communicate with me more directly? Sign up for the Organized Chaos newsletter right here to get emails from me! 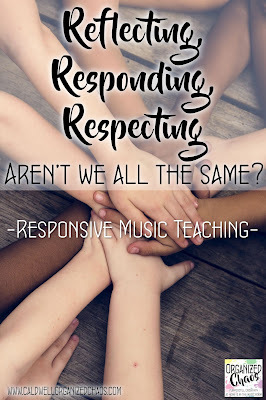 Read more "Reflecting, Responding, Respecting: aren't we all the same?" 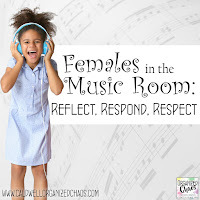 As I continue my focus on reflecting, respecting, and responding to marginalized people and perspectives in the music room, I'm focusing again today on students with differing abilities. I wrote previously about ideas for reflecting people with special needs in the visuals, stories, and materials that we use (read that post here), but today I'm talking about strategies for better responding to the needs of students with differing abilities in the inclusive music class setting. 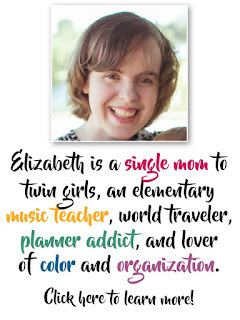 I have been teaching integrated music classes with students from self-contained special education classrooms and general education classroom settings for a few years now, and I have also had experience working with students who are in the general education classrooms with individual accommodations and/or aids and other differing abilities and needs. 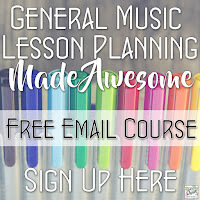 Many of the ideas in this post come from those experiences, but I am also drawing from advice shared from other music teachers and special education teachers with a range of experiences, including parenting children with special needs, working in self-contained classrooms, getting certification in special education, and more: thank you Chris Powers from Madison, WI, Helga Thordsen from Priest Lake Christian Academy, Stuart Penman from Woodlands Special School in Plymouth UK, Amy Corvi, Melissa Ann, Jocelyn Escobar Patterson, and Laura Allison for sharing their insights! The great thing about the strategies and ideas I'm sharing today is that they are effective for all learners, not just students designated with "special needs". No matter what your teaching situation may be, this is good advice for all of us! The most important element for successfully responding to differing needs and abilities in the classroom is communication and information! This is especially important for teachers like us who teach hundreds of students- we are often left out of the loop on IEP's and other individualized plans, information about specific needs or accommodations, etc and that can be detrimental to our ability to effectively respond to individual student needs. I have found (and many other teachers echoed this as well) that the most important thing I can do is to stay in as regular contact with special education teachers and other specialists who work with my students. Besides making sure I understand each student's needs and strengths, I check in regularly with teachers to find out how they perceive things are going in music class, and ask them about anything unusual I may have noticed to get their advice. I also send teachers the upcoming month's lesson outline each month so that they can see what we will be working on and anticipate anything that might be difficult for specific students. Communication can make all the difference in the world! One of the most difficult aspects of teaching integrated classes for music teachers can be working with other adults that come with students as paraprofessionals, 1-on-1 aids, or other forms of student support. It can be awkward to know how to seamlessly integrate another adult into the running of your classroom, especially if you're used to doing things a certain way (not that I would know anything about that..... *cough*)! As already mentioned, communication is the key here- para's can be your biggest asset for teaching students with special needs if you are both clear on how to best work with each other in the classroom, and building positive relationships with them will help you avoid any feelings of resentment if you need to ask them to change the way they operate in your space. One thing I have learned over the years is the importance of giving aids a specific place to sit in the classroom (at least as a starting point). Often I've found it works best for me to have them sitting just behind or next to the student(s) they're working with so they're not part of the student seating configuration but still close by (so if the students are in a circle, have the para sit just outside the circle, or if the students are in rows, have the aid sit next to the end of a row, etc). Figuring out a way for the adult to unobtrusively work with their assigned students while still giving those students a sense of belonging within the classroom setup will not only help the students feel more included but will allow the para's to be more comfortable interacting with their students without feeling like they are getting in your way. This setup also allows students to develop independence more quickly with the aid out of their direct line of sight. Finding opportunities for students with differing abilities to model a skill for the class whenever they're able can make a huge difference in building respect amongst all students and fostering classroom community and belonging. Observe students and find their strengths, and look for opportunities to have them demonstrate something for other students that plays to those strengths. You can also use those strengths as the starting point for fostering new skills. Depending on student needs, visual cues can help reinforce specific classroom procedures or concepts. Visual schedules can help students anticipate what's coming next, pictures can help pre-readers with new concepts, and if/then charts can help remind students of consequences and motivators. Another very successful way of using visual cues to help students with special needs (and all students!) is through color coding. Colors can be a great learning tool for everyone (in fact I color-code everything to help me stay organized myself! ), especially when it comes to reading music notation. Color-code the notes on the page/ screen to match classroom instruments, or add (non-damaging) small stickers to notes on pitched instruments to match the notation. 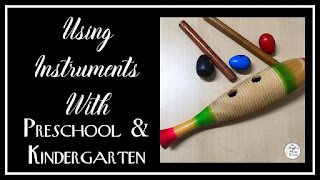 Boomwhackers, colored handbells, glockenspiels with colored bars, and other color-coded instruments are great tools to aid with melodic note reading and understanding pitch concepts! Visual cues can be especially helpful in music classrooms because there are so many stimuli competing for children's attention! If you haven't heard of it before, the prompting hierarchy is something special educators use that can be helpful for thinking about ways to support students who are struggling. Giving students an opportunity to hear the same song and do the same activity several times can be a great tool to build learning. In a self-contained setting, you can do this by repeating the same activities over several lessons. In an integrated classroom, I've found it's a great opportunity to build skills for students on the full spectrum of abilities by adding new elements to the same activity, whether that's adding new movement or instrument parts to a song, having students notate a familiar song while others sing it, or using other ways to extend learning with the same material. Repetition also applies to the overall structure of a lesson- having a predictable routine for each class period can reduce anxiety and help all students feel more comfortable. Here are my procedures for beginning class, and here are my procedures for the end of class. You don't have to follow the exact same formula every day, but incorporating some predictability into the beginning and end of class at least will make a huge difference! Being able to anticipate what comes next and understanding what is expected of them can make a huge difference in all students' comfort level in the classroom, especially for students with social/emotional needs. 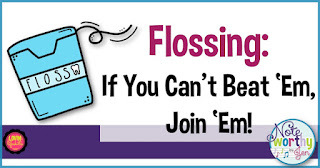 Procedures are everything! Whether it's handing out instruments and materials to students, moving from one place to another, or transitioning between activities, it is so helpful to clearly explain and break down procedures when you're doing something new (and review those procedures until students are comfortable)! This means as teachers we need to reflect on what procedures we will need to do the activities we've planned in our lessons, and think through the most efficient ways to do them. If you know there are certain procedures that will be especially difficult for certain students, ask the homeroom/ special education teacher if they can pre-teach them beforehand, and make sure para's and other adults in the room know what the expectations are so they can help reinforce them as well. Exploration is another key that is valuable for all learners but often gets lost in the push to fit everything into short class times. Some students may benefit from having more time to explore an instrument while others are practicing playing specific rhythms, for example, or explore vocal sounds while others are working on pitch matching or demonstrating specific voice types etc. As much as I can, I've tried to be more conscious about giving students time to freely explore new instruments and their own voices rather than jumping straight into specific skills, and this has been an asset for everyone's learning (and behavior)! 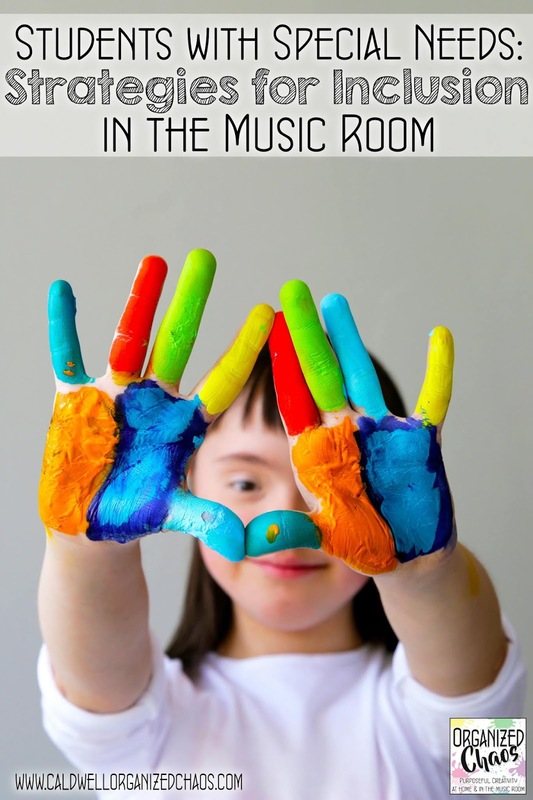 I hope this post helps other music teachers better meet the needs of all students, especially those with differing abilities. What have been your experiences working with students with special needs? Please leave questions and ideas in the comments so that we can all continue to learn from each other! Want more? Be sure to sign up here for the Organized Chaos newsletter! 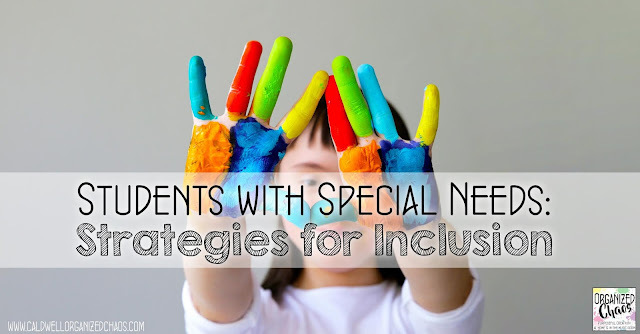 Read more "Students with Special Needs: Strategies for Inclusion"
The Christmas season as a parent of young children is a two-sided coin. 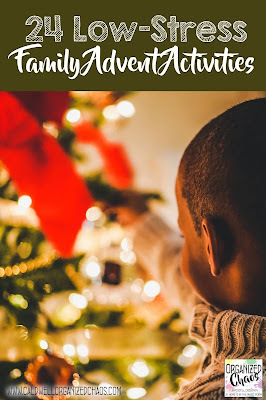 On the one hand it is the most magical way to experience the holiday, but on the other hand it can get overwhelming trying to fit in all the things you want to do with your kids! My solution for the last several years has been a low-key list of small things to do each day in December to save me the worry of figuring out how to fit everything in while keeping the holiday cheer going strong in the most low-maintenance way possible! Here's last year's list for 6 year olds, my list for 5 year olds, my list for 4 year olds, and the one for 3 year olds, if you're interested in more ideas for the littles. I love putting the calendar together each year because it relieves the pressure I would otherwise feel to make sure I'm taking the time to enjoy the holiday with my girls, and doing small things each day makes the whole month more fun without anything getting overwhelming! What holiday traditions do you have with your family? 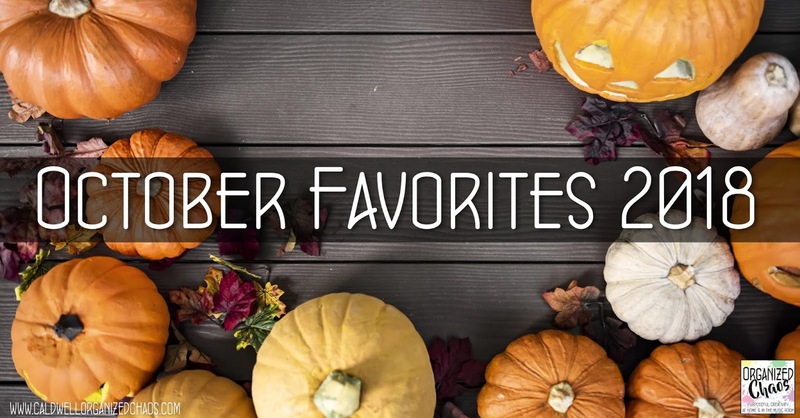 I'd love to hear your favorites in the comments below. Want more content and ideas sent straight to your inbox? Sign up here for the Organized Chaos newsletter! 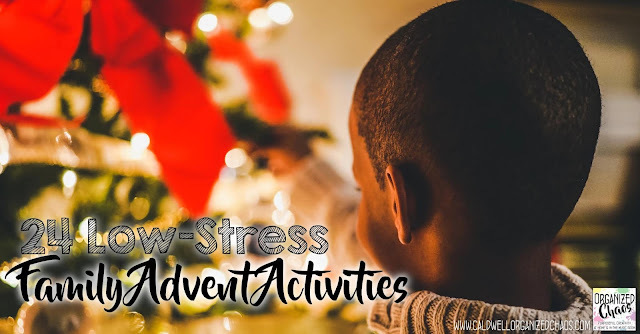 Read more "24 Low-Stress Family Advent Activities"
As I continue to think about ways to better reflect, respect, and respond to traditionally marginalized people and perspectives in the music classroom, I am turning my attention today to people with special needs. 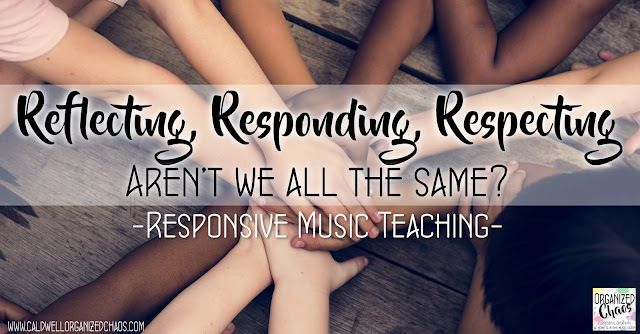 In particular, today I want to focus on ways to better reflect examples of people and musicians with different needs in the music classroom to work towards normalizing and making all students feel more comfortable and welcome in music class. A common theme in all of my reflections on ways to better serve marginalized people and perspectives has been the need for more diversity in the resources, visuals, and examples I use in my classroom. Including people with special needs in this move towards diversity has admittedly been an area that I have overlooked in the past. Along with some of my own ideas, I am grateful to have gotten input and ideas from music teachers and special education teachers around the world on ways they include representation for students with special needs in their classrooms: Helga Thordsen from Priest Lake Christian Academy, Amy Corvi, and Laura Allison. 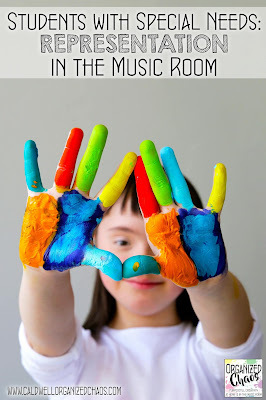 So the obvious first step in better representing people with differing abilities is to include them in regular education music classes whenever appropriate/ possible. 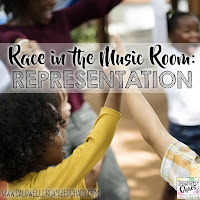 I know in many cases music teachers don't have much say in when, how, or with whom students come to their classes, but when you can, I encourage you to be an advocate for inclusion. Of course there are situations when it's not appropriate, but in more cases than not, I have found all of my students and I reap huge rewards from the additional work I put in to include everyone in the same class. 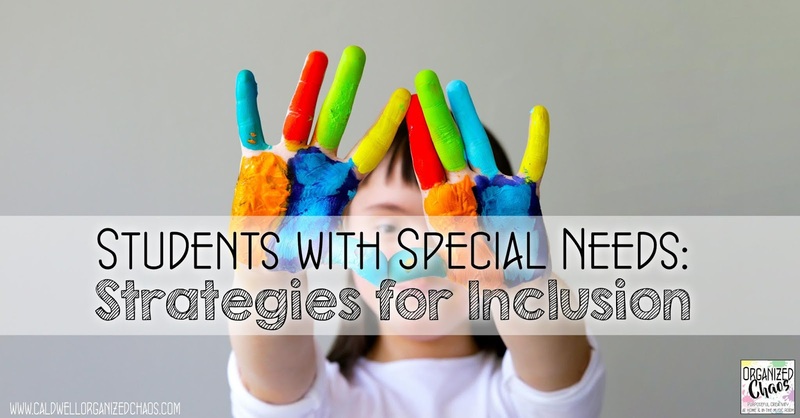 The best way to make sure inclusion happens in the most successful way possible is to communicate regularly with and do everything you can to be an ally for special education teachers, aids, and students. You can read more of my specific suggestions for inclusion in music class in next week's post (so stay tuned! ), but it's worth mentioning the importance of inclusion here as we talk about representation. What students see in the music classroom and other visuals is so important to what they view as "normal" and whether or not they are welcome and included! 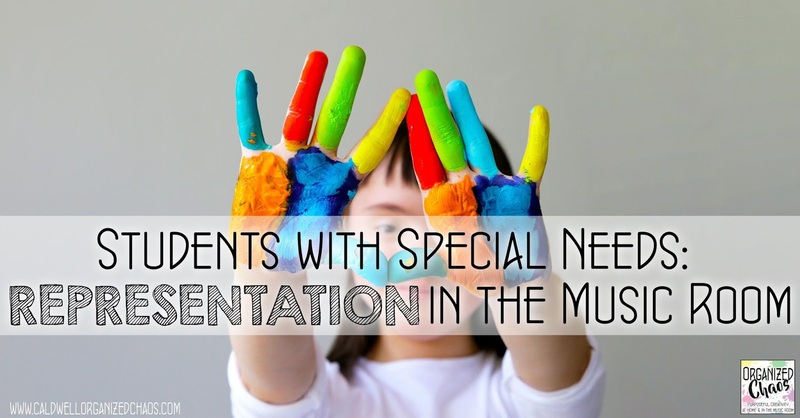 Include picture books and posters with images of people with special needs in the classroom. Use video examples that include people with differing abilities in them. Incorporate images of people with special needs into other visuals like projected slides, worksheets, and handouts. Incorporating these images more regularly, rather than only focusing on them when their difference is the main point, will help to normalize and make everyone feel more included. 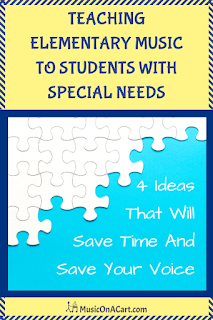 I hope these ideas help you find ways to more regularly include people with differing abilities into your classroom! I would love to hear more ideas and resources as well- please share them in the comments as we continue to learn from each other. Want more resources like this sent straight to your inbox? Sign up here for the Organized Chaos newsletter! Read more "Students with Special Needs: Representation"
It was so wonderful getting a chance to stay at home and relax with my family without any responsibilities- just a chance to unwind after a crazy week. Plus it gave me time to clean the bathtub and the garbage can. They were getting pretty gross and I had been meaning to clean them both for weeks! Feels so good to get that taken care of! I even had time to sit down and sort through the mail, write out a few checks, and fill out the rest of those school forms. 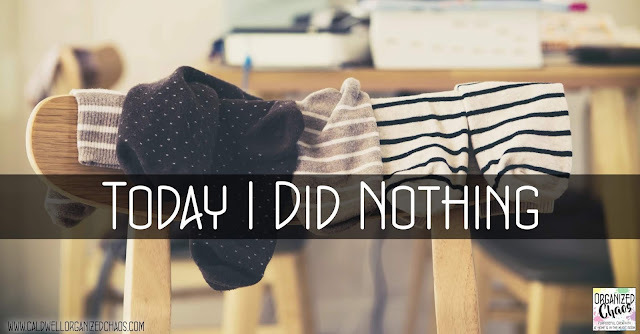 Having a day to do nothing is so awesome. I had time to cook meals that would be too much trouble on a busy weekday. We even baked pumpkin bread together and I had time to make a full pot of coffee to keep in the fridge for extra-crazy mornings. Oh and clean the coffee maker! And of course the best part was having time to relax and play with my kids. 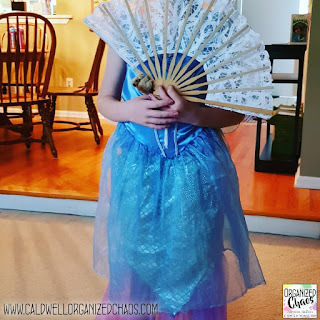 They come up with so many creative ideas for pretend play at this age! I was a student, a monster, and a queen all in one day. The trick, of course, is getting them to clean up all of their messes afterwards! Oh, and while I'm downstairs playing school I might as well throw in a load of laundry. I love having time to just chill at home with my family! Better make sure the kids get their practice time in. They're both getting ready for their recitals in a couple of weeks! And when they're done we can finish that board game we started on Thursday. Hey and now that the board game is put away I can vacuum the floor! Weekends like this, when we can stay in our pajamas all day and do nothing, are so refreshing. So glad I decided to do nothing today. 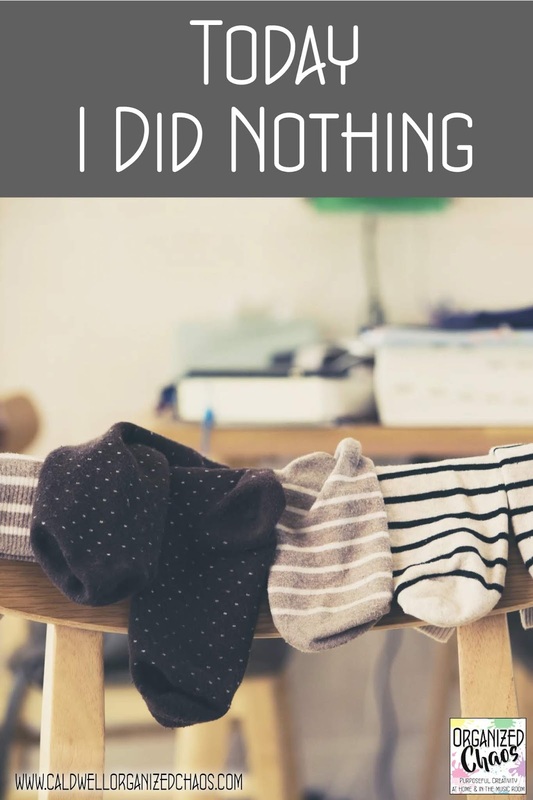 Read more "Today I Did Nothing"
I have been focusing lately on strategies for better reflecting, respecting, and responding to traditionally marginalized people and perspectives in the music room. Today we're tackling a specific musical genre that has been largely ignored by mainstream music teachers in the United States: hip-hop. It's pretty mind-blowing to think about just how little we even reference hip-hop in music class compared to how widespread its popularity is outside of the school setting. My hope is to give music teachers some simple entry points to help us at least begin to scratch the surface. Let me start by saying I am in no way, shape, or form an expert in hip-hop music. I am a white woman who grew up in East Asia in a conservative missionary family. There's not much that's more foreign to my upbringing than hip-hop. That being said, for the last 6 years I have been teaching in a school where the vast majority of the music my students (and the wider community) listen to is hip-hop. No other genre comes close. So I have spent a good amount of time and energy over the last few years familiarizing myself with the genre and exploring ways to incorporate it into my teaching. Please understand that these ideas should by no means be the end product, but rather the starting point for those of us who are just beginning to learn! For general music there are lots of ways to use hip-hop to teach concepts and skills we already teach. Here are just a few! 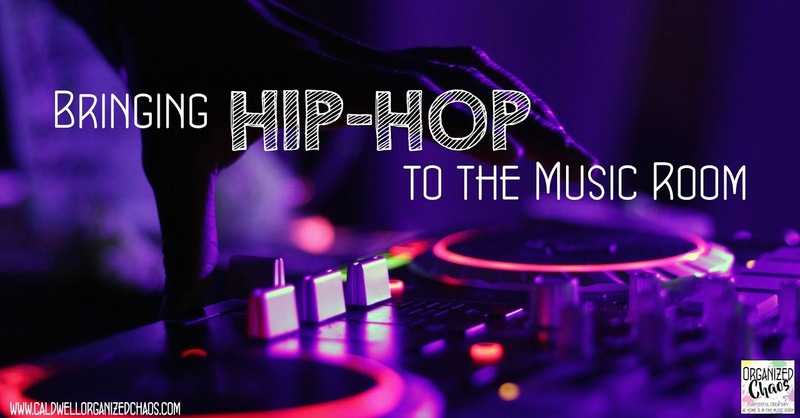 Music History: Hip-hop should be a focus of any discussion of modern music within any music history lessons, whether it's a "composer/ artist of the month" or an overview of music's development through time. The Netflix series Hip-Hop Evolution has lots of great information and interviews with a wide variety of artists. Syncopation: Use examples from songs or even just loops to demonstrate syncopation- here's a loop you can download for free that accentuates the "1-syncopa-4" rhythm pattern. You could also use those same song excerpts and loops as accompaniments for students to play along with as they read and/or perform syncopated rhythms. Contrasting Sections: One of the easiest ways to incorporate hip-hop into general music is through the study of form. Many songs have a clear distinction between the chorus, which is often sung, and the verses, which are often rapped. Use a song like "I'll Find You" (above) to identify contrasting sections and label the form, or use the chorus from a song as the "A section" and have students create new sections to go with it. This is a good place to incorporate songs that as a whole may be questionable for use in the classroom but will immediately connect with students: "I Like It" by Cardi B (instrumental version here) is definitely not something I would use in class but the chorus would be an excellent starting point for having students create their own raps about things they like. "I Can" by Nas (instrumental version here) may actually be OK for high school age but the verses are probably too adult for elementary. The chorus, though, has an excellent message that would be the perfect starting point for contrasting sections. Practicing New Notes: When beginning instrumentalists are practicing a new note on their instrument, have them improvise with that note (or a small set of notes) over a track. Use any drum track you have (you can download for free here). Playing a Concert Bb Scale: It is fairly standard practice for bands to begin rehearsals with some version of a concert Bb scale. Mix it up by having the ensemble play along with a drum track (see above) or use a pitched loop that fits the scale (here's a free one). Vocal Warm-ups: As with the scale example above, choirs can sing their warm-ups with a drum track. Another way to incorporate hip-hop into warm-ups is to take a phrase from a familiar song and sing it (going up or down chromatically) as the warm-up. The last phrase of the chorus from "I'll Find You", with the words "hold on and I'll find you" (see above), is sung on do-re-mi-fa-mi-re-do-re-do and would be perfect for a choral warm-up. Simply adding a drum track may not seem like much but it can be a powerful way to begin to infuse hip-hop musical practices, especially if you can have some conversations to contextualize it for your students. Compare the addition of a track to your warm-up to DJ's pulling a loop off of a record to mix with another on their turntable. Talk about the emphasis on the backbeat and syncopation in different genres (this article by Ethan Hein gives a great, more in-depth explanation of this). Making these connections conscious for your students will get them thinking and exploring hip-hop in meaningful ways, just from a simple warm-up practice! 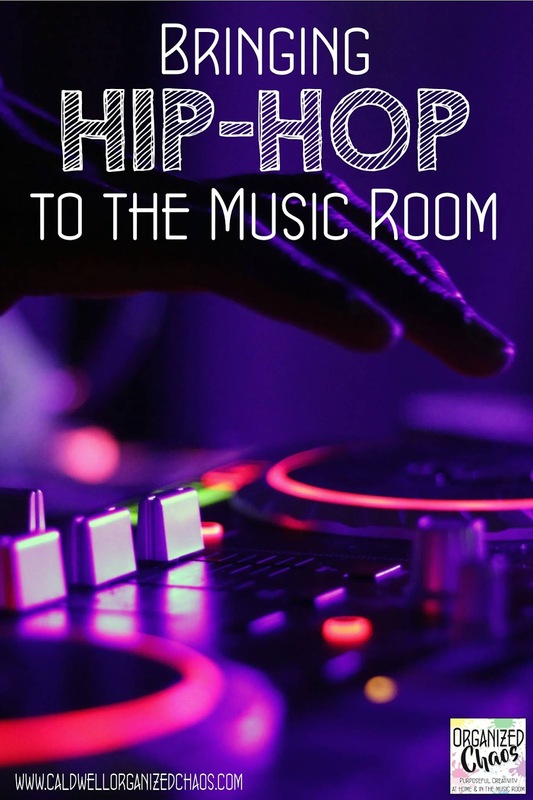 I hope these ideas will help to make the idea of using hip-hop in music class less intimidating and more accessible, but I also hope they will spur further study and exploration. The genre of hip-hop deserves more than a box to check off in our teaching! I would love to hear more ideas from you in the comments section as well. Special thanks to Jamie Ehrenfeld, Gerard Langley, Jarritt Sheel, and others for sharing their thoughts and helping to inform my writing for this post. Stay connected and get timely updates and resources by signing up here for the Organized Chaos newsletter! 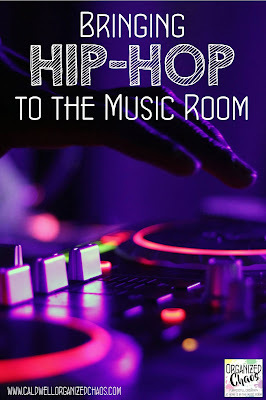 Read more "Bringing Hip-Hop to the Music Room"
Another month has flown by! October is always one of my favorites, and this year was no exception. Here are some of my highlights from the past month as told by my Instagram pictures from October! I love it when my daughters come up with crazy creative ideas, and I'm so glad one of my girls decided to go as a "princess/ mermaid/ famous singer with a pet koala" for Halloween this year instead of picking a pre-made character. They come up with the wackiest ideas sometimes and it is so much fun to see their imaginations at work! I've been meaning to write more about this, because it has proven to be pretty powerful in my classroom. For now this mention will have to suffice- I started keeping a sticky note pad and a pencil in the corner of a table at the back of my classroom for when students need to tell me something but want to do so privately and/or I'm not able to hear them as quickly as they need me to. I have a few older students in particular who I realized were often disrupting class because they were frustrated when I didn't immediately listen to their ideas and questions in class, and a few who often perseverate over a problem from outside music class but are reluctant to talk about it. 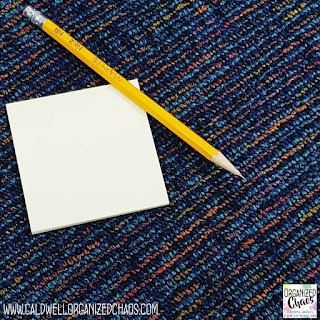 I spoke privately with those students outside of class and let them know where the sticky notes were and that if they ever needed to tell me something but I wasn't able to hear them right away, that they could write it down and hand me the note. 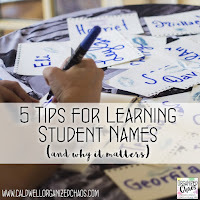 This has been a great way to allow those students to feel heard without taking time away from the lesson for the other students, and has been a great alternative for those shy students that would leave without resolving anything in the past. Simple but very effective! I have to mention this again because it is so important to me: I've been thinking and writing about various issues around the topic of better inclusion for marginalized students in the music room and it has had a profound effect on my practice. If you haven't already, I really hope you'll click on the images above to read the posts I've shared in this blog post series so far, and stay tuned because there's more to come next month! I love sharing helpful music teaching articles I find each month- click on each picture to read the full posts! I hope you found something inspiring to motivate you as we head into a new month! What have been your October highlights? What are you most looking forward to in the month ahead? If you want to get updates from Organized Chaos sent to your inbox, you can sign up here for the newsletter! 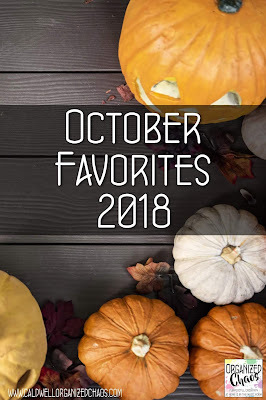 Read more "October Favorites 2018"